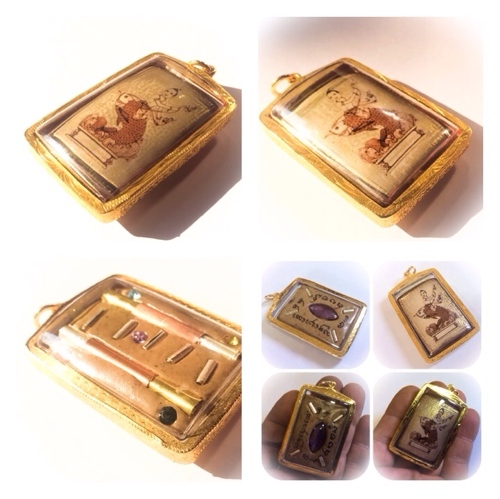 Kumarn Tong Mang Kang Ongk Kroo Masterpiece Version Locket – Pra Ajarn Supasit Wat Bang Nam Chon. 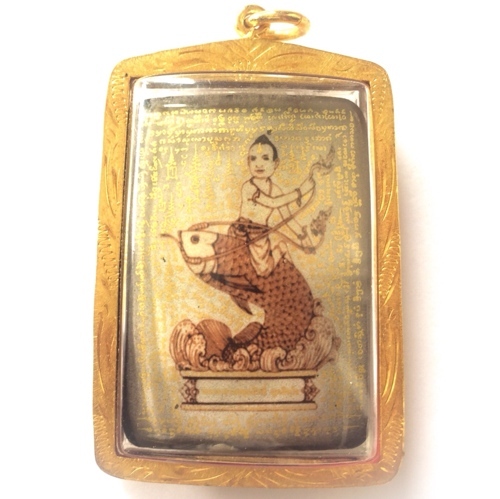 This Kumarn Tong locket from Pra Ajarn Supasit of Wat Bang Nam Chon, invokes the powers of Blue Dragon Boy and Kintarō golden boy. This is a special Ongk Kroo Masterpiece Version locket with valuable Muan Sarn Sacred Powders and inserts in the rear face of the locket. 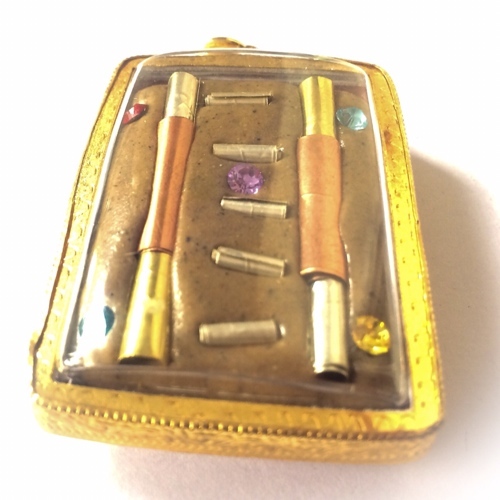 Each locket, is individually made to be unique, and therefore has differing items inserted in the rear face. Lockets, already encased in decorative gold plated casing, and sealed in waterproof acrylic. 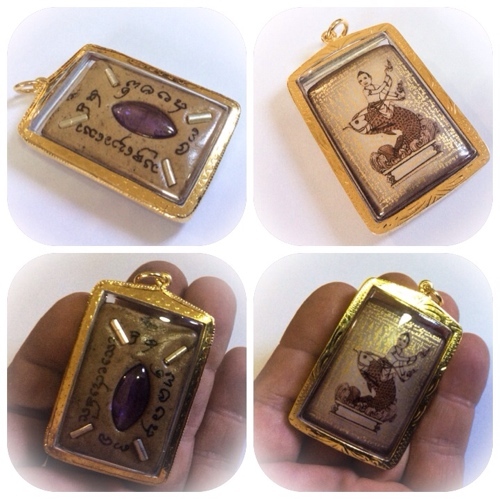 No two lockets are the same on the rear face because of this, but each amulet has received the same amount of attention and empowerment, and the individual special empowerment either hand of Pra Ajarn Supasit, on each single amulet. In most cases were larger gemstones are inserted, one will find less place for insertion of Takrut spells, and, in the case were smaller gemstones are inserted, then, the opposite will come into effect namely, more tiny gemstones and Takrut. It is of course obvious that the larger gemstones are more valuable when polished and cut, then the small gemstones. 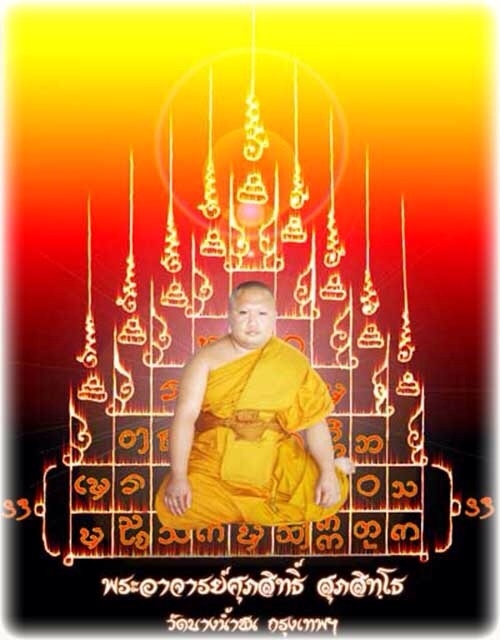 Pra Ajarn Supasit has hence used his own sense of balance and equal empowerment to distribute the sacred items inserted in the equal manner despite the fact that each individual amulet is distinct from its brother. The same goes for the invocations of the spirit dwelling within the locket has also been individually empowered for individual spirit inhabitation locket per locket. 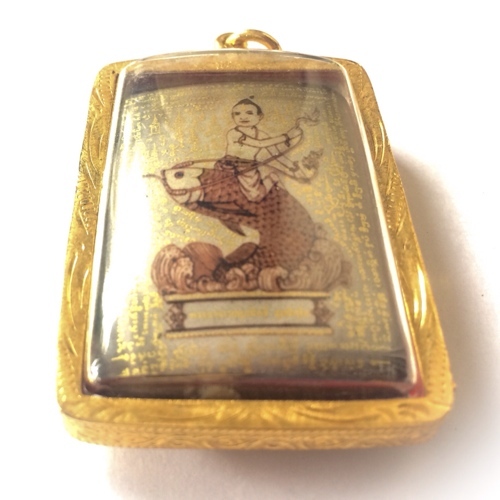 The imagery on the front face of the gold plating cased locket, playfully delves into two different myths; one from China (The legend of Wang Shuh), and the other from Japan (Kintarō golden boy). It is notable that in both of these mythical stories the Dragon is present and this is the reality of the magical elemental force which these myths represent and that is what is invoked, within these Amulets. The amulet is however of course empowered that only with the elemental forces which the image is used to depict in Chinese and Japanese mythology and mythological creatures, rather, is primarily involved with the Wicha Kumarn Tong using the original form of ancient necromancy from the Khom Era. 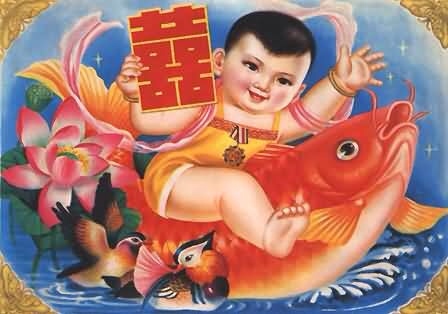 It is also invoked, with the magic which brings the attributed blessings and powers of the blue boy, who is actually an elemental spirit, who can take the form of a storm dragon, or can be seen as a blue, red, golden, or white skinned boy, riding on the back of a carp fish. Pra Ajarn Supasit is world famous for his amulets despite the fact that he only ever makes very few numbers of each type and edition, which would normally reduce the chances of becoming widely known. But, because of the exquisite beauty, rarity, and quality of his amulets, as well as for the powerful effects, his name has come to be reverent in the homes of Buddhist devotees around the whole world. 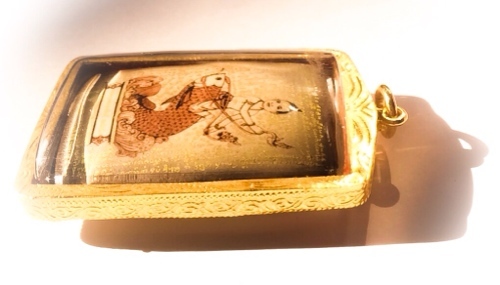 Only an extremely small number of these special masterpiece lockets were made using some of the finest Muan Sarn Sacred Powders of Prai Kumarn bones, and other necromantic earth ashes and powders from the sumps of funeral Pyres, and Nam Man Prai oils. Earth from seven cemeteries, seven marketplaces, seven busy seaports, and seven giant termite mounds, were added. But in the case of these special lockets an extreme high percentage of bone powders and an admixture of Pong Sanaeh Ya Faed, were also added. Depending on each particular locket, there are different items inserted (e.g. for wealth increase enchantment attraction and luck. Inserted items may differ from the ones seen in the pictures here but we guarantee the beauty and attractiveness to be equal with all lockets. Pra Ajarn Supasit also released some very rare and finely carved small wooden Kumarn Tong statues in this same 2556 BE Special edition. His amulets are not only of the highest quality, highly popular and known for their authentic magical powers, but are also destined to increase in value at a considerably faster rate, with a high multiplication factor. We personally think that amulets should only be viewed in context of reverence, and appreciation of their beauty, but do understand that some people invest in precisely this kind of amulets because of their inevitable extreme rise in value and think of them as as a speculative investment. Pra Ajarn Supasit’s amulets are highly targeted by such speculative investors, because of the certainty of the rising value, and the rapid rate at which they rise. This is of course, due to the rapidity of depletion of each series, with which they become immensely rare and hard to encounter. Pra Ajarn Supasit has spent a whole Trimester (Traimas rainy season empowerment), two in bed all the magical powers of sorcery he can muster into these amulets, and to awaken them to live with the spirits of all the different Prai Kumarn Tong he could contact, and ask to assist in the invocation of Spirits, to dwell within the Inanimate forms of the Sacred Lockets. Chant and make offerings every morning and evening, and chant the Nippana Sutra for Prai 7 times each session (always chant Kata to the Triple Gem 3 times before any other Kata Chanting). Sa A Ni So (call to come to you). So Sa A Ni (awaken and empower to send on missions). Ni So Sa A (use to ward away spirits and ghosts). A Ni So Sa (use to make the Kuman stay in one place).